Nick Jr. characters abound in a trio of titles, along with gizmos and gimmicks that make them more than your average books. 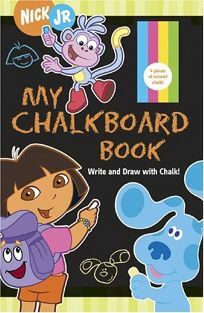 My Chalkboard Book: Write and Draw with Chalk includes four pieces of chalk in a box that peeks through a die-cut opening in each oblong board page (which can be written on). Little Bill helps readers write their numbers and letters, and then readers can help Dora fill up her backpack. .